ipPerformance newest report covers a multitude of IP department practices including, billing/fee arrangement, costs, staffing, work flow cycle-time, operational locations, patent committees, patent search approaches, IP task outsourcing, licensing responsibility, and outside counsel preparation and prosecution responsibilities. We learned in this study that most companies’ have a variety of professional and non-professional functions that spend a significant portion of their time on patent application preparation and prosecution activities. Companies use multiple fee arrangements with their law firms. Patent searches are conducted prior to most patent filings. These results are elaborated and many other facts are reported in our new report on Corporate Intellectual Property Best Practices. Over 60 charts are included in the report. Best practices lead to superior performance. The purpose of the Best Practices Analysis is to illuminate the best practices associated with intellectual property operations. 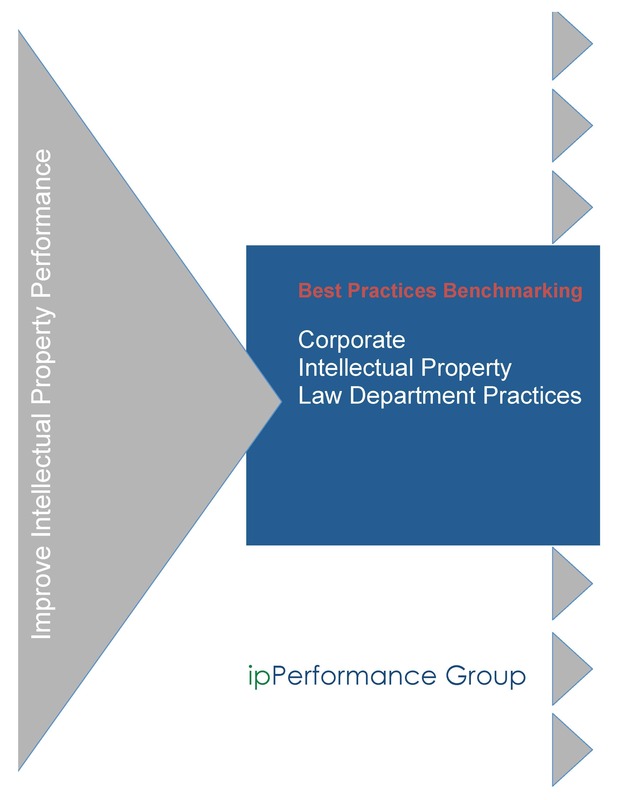 We analyzed a number of key practices and IP program performance metrics to provide best practices guidance. How are most of your IP attorneys assigned? What is the estimated percentage of time that the entire in-house attorney/agent staff spends on the preparation/prosecution docket? Are patent operations centralized or decentralized? Does your company use a patent committee to review invention disclosures and select disclosures for which to pursue patent protection? In the past fiscal year, did your company’s IP department use external benchmarks to manage performance? Was there an annual goal for the number of patent applications to be filed by your company? Was there an annual ceiling on the number of patent applications that would be filed by your company? Does your company charge internal clients (business units, divisions, etc.) for in-house legal work? How do companies allocate patent prosecution work to their U.S. firms? Does your company have a financial reward (cash or stock) program for U.S. inventors? Have you adopted alternative billing arrangements?